The third Shuttlecock House Party features two Kansas City acts and two Lawrence acts coming at you head-to-head. Don't worry though -- everybody wins here. Lawrence bad kid punkers Nancy Boys are making the trip down K-10 along with Vivid Zebra's Jonah P. & Ricky Roosevelt, fresh off their "In The Dark" EP. Representing Kansas City are youth crew newbies Liquid Swords and a tough new addition to Caviart, Ray Muney. 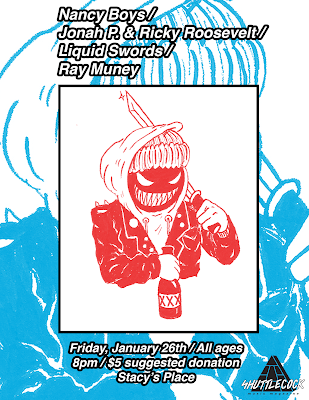 The show is Friday, January 26th, 2018 at Stacy's Place in Kansas City (ask a punk or DM us on social media -- @ShuttlecockMag -- for the address). It's an all ages gig, the suggested donation is $5, and doors open up around 8pm. Reach out ahead of time with accessibility questions. There are steps up to the house and steep stairs to the basement. We will do our best to help you if either of those present a problem. Also, be sure to let someone involved know if anyone is making you feel uncomfortable for any reason before or during the party.